Birthdays at the office equal free lunch for everyone! 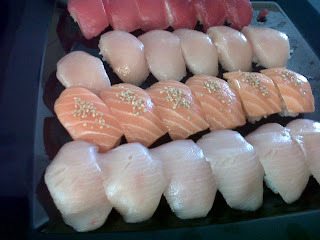 Today our lunch came from Sugarfish in the form of giant platters of sushi. It only took 15 of us about 20 minutes to devour the 8 platters that came our way. Hello food coma. I'm happy to say this meal fully fits into my attempt at October Unprocessed (the dessert, however, definitely did not). Edamame aka steamed soy beans? Check. Seaweed? Check. Rice? Whole grain check. Raw fish? Check. Cucumber? Check. 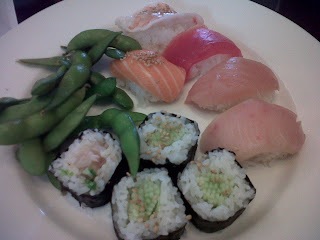 I had to avoid a couple of the offerings, namely the spicy tuna roll (tends to include mayonnaise, which, while it can be made of unprocessed ingredients, most likely in it's commercial form is not), and the soy sauce (you'd be hard pressed to find a preservative-free soy sauce). If you're sushi-ing at a restaurant, it's pretty easy to modify orders to make sure sauces and mayo don't hurt your chances of eating all-natural, unprocessed foods, so just sit at the bar, ask the chef what he's using, and enjoy the show!